Right-click on the RSS button. Click on "Copy shortcut". Copy to your mail program's Feeds, where it asks for a Feed URL. (Or into your RSS reader). Click "add", and you're done. Now you're subscribed! You'll receive all Shamrock Candle's latest updates. Planning a celebration? Deck your tables with sparkling wine cup centerpieces. Wine goblets hold ball and egg-shaped candles with festive flair...narrower champagne flutes make stylish holders for long tapers...turn upside down wine glasses into unusual candle stands. Exercise your diy skills: decorate the graceful stems with ribbons, flowers, and other ornaments. 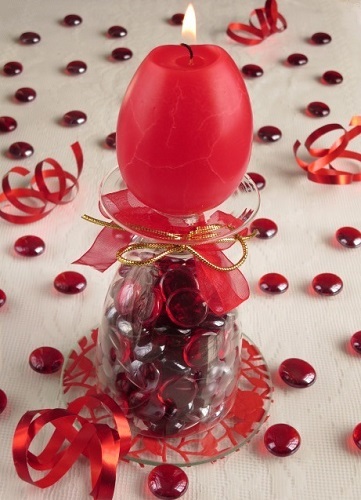 Use the ideas below as inspiration, to make your own distinctive centerpieces. You'll hire wine glasses in large quantities for weddings and your special events anyway. So, you can create exciting candleholders, with the stemware already at your disposal. Wine glasses, hand painted with cute rabbit faces, make fun Easter centerpieces, for the whole family. A pair of burlap bunny ears, with pink spots, decorates each stem. The wineglasses display upside down. 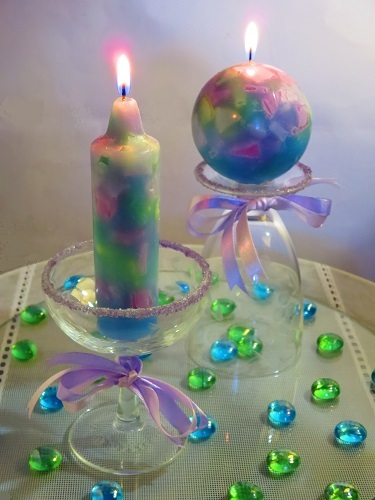 These child safe candles have frosted tealight holders on top, glued on permanently. This set includes 3 wineglass candles, of different heights. The stands measure approximately 9½", 8¼" and 7" tall. Set an event table agleam with fine glassware and candlelight. With the help of this kit, you can produce superb wine glass centrepieces, in no time at all. It includes 3 different sized wine glasses; 3 white scented votive candles; flowers. Get your own round mirror tile, and arrange the wine glass votive holders in an eye-pleasing display. Transform ordinary wine glasses into dazzling table lamp centerpieces. Tea light lamps - shaded with swirl-patterned vellum - add a jewel-like sparkle to your holiday tabletops. The set includes 12 adjustable lampshades. Using different size glasses? The shades come with two rows of tabs. You can fit them onto wider wine goblets, or narrower champagne glasses. Each shade comes with 24 self-adhesive rhinestones. These aren't already attached; you'll have to stick them on, with your own nimble fingers. Only for use with LED tealights. So, you're free to display these at all venues, even where flame free restrictions apply. Simple, easy and supremely elegant...float a candle in a wine glass, and enjoy the magical effect of candlelight playing through water and the transparency of the glass. Line up a row of floating candle wine glass centerpieces down the centre of a long table...place one at each place setting...or group three different sized glasses, (one taller and one shorter than the third), together in the middle of a round table. 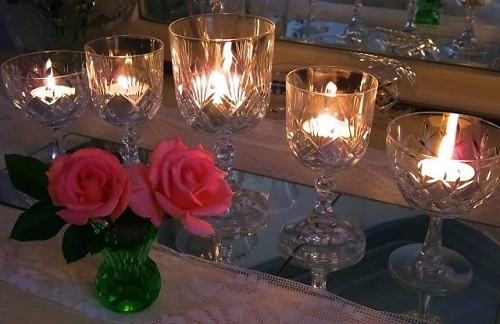 Create makeshift candlesticks with votive cups and wine glasses. Attach a votive glass to an overturned wineglass with a dab of Presstik. (Glue the two pieces together with epoxy glue for a more permanent arrangement). We decorated the stem with transparent pink, and white pearl, beads: thread beads onto sturdy crochet cotton, using a thin embroidery needle. Tie the beads around the glass's stem. Stick a tea light into the votive glass. Tea lights decorated with glitter give a nice sparkle. Make simple floral arrangements in wine glasses without florists' foam. 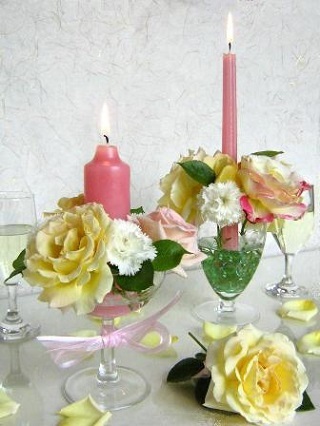 Simply arrange short-stemmed flowers around a pillar candle in a shallow, wider glass. Or stick longer-stemmed flowers around a taper in a taller, narrower glass. We used roses and carnations. Have fun experimenting with your favourite flowers! Miniature flower arrangements, in upside down wineglass candleholders, make unusual centrepieces for weddings, bridal showers, and many more special occasions. We used cheerful pansy faces, but you can use any small flowers or buds. 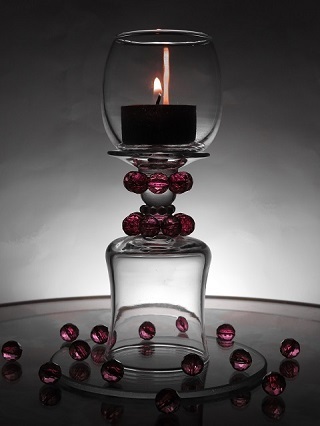 A ball, (or small pillar candle), on the foot of the glass, completes the arrangement. The graceful stems of wineglasses present you with unique opportunities to decorate. Turn wine glasses over, tie fresh flowers to the stems with ribbons, stick candles on top, and you have pretty floral centerpieces, adding notes of grace, and elegance, to your wedding, or bridal shower tables. Inverted wine glasses, filled with glass nuggets, marbles, or beads, form dazzling candlesticks, with the base, (now on top), holding the candle. You'll need: a wine glass; a candle; glass nuggets; a mirror tile or circular pane of glass, slightly wider than the rim of the wine glass. Fill the wine glass with nuggets. Place a mirror tile, or glass pane, over the glass's opening. Turn over carefully and place it on your table. Place the candle on the base of the glass. Decorate your table with more nuggets, ribbons or serviettes of matching colors. Champagne glasses of the same types or designs, but of different heights, make a dramatic centerpiece, when grouped closely together in the center of a table, and with a taper candle in each one. You'll need: 3 champagne glasses; taper candles; coarse bath crystals or florists' gel, (to stabilize the candles). Arrange the glasses in a circular shape. Pour crystals or florists' gel into each glass. Wedge the tapers firmly into the crystals, until they stand firmly and securely upright, by themselves. Wine glasses rimmed with sugar, and filled with candles, make ideal party centerpieces. Use coloured sugar for birthdays, coconut for the snowy effect of a "white Christmas", coffee granules for rich, earth-toned colour schemes. Milk, lemon juice, or any other sticky liquids adhere the granules to the edge of the glass. You'll need: wine glasses; sugar; milk; candles. Pour milk into a shallow dish. Dip the wine glass's rim into the milk. Pour sugar into another plate. Dip and rub the glass into the sugar until well coated. Leave to dry. Place a candle into each glass. Tip for making coloured sugar: Pour sugar into a container. Drip drops of food colouring into the sugar. Stir well with a fork. Leave to dry for several hours. Mash through with the fork to eliminate lumps. Ready to use! 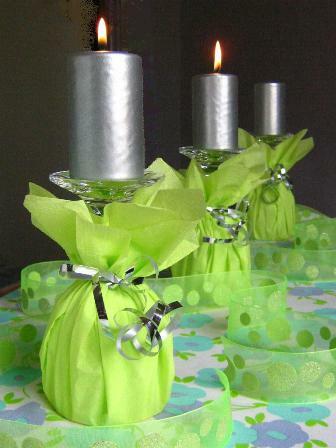 Wine glasses, decorated with napkins and ribbons, make festive pillar or ball candle centerpieces. Use colorful paper napkins for birthdays, or informal parties. High-quality fabric or cloth napkins add a touch of distinction to weddings, or formal celebrations. Place the 2 glasses in the oval dish. Pour crystals into the glasses. Wedge the candles in firmly. Layer the bottom of the dish with glass nuggets. Pour water into the dish, up to the stems of the glasses. 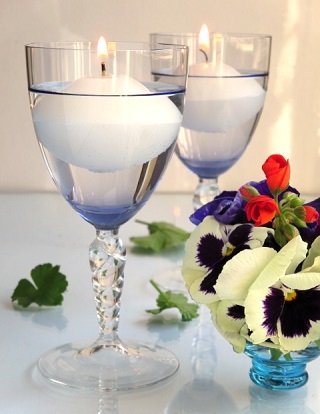 Arrange flowers and leaves in the water under the candle glasses. Turn wine glasses into dazzling candle globes. The refractive qualities of pressed glass, cut glass and crystal, with deeply-etched designs, cast shimmering patterns of candlelight onto your surroundings. Use LED tea lights for fragile glass pieces. Group these decorative wineglasses together on a shiny round metal tray; display them in a row on a long mirror tile, (or line up 3 or 4 square mirror tiles); place a white cloth underneath a pane of glass, with an arrangement of wine glass candleholders on top. Use glasses of different shapes and sizes, with the same or similar designs. Place a tea light in each one, and you have a stunning display of wine glasses transformed into hurricane candle holders. This effect is spectacularly beautiful, but can look quite cold, (despite the glowing candlelight). Surround the glasses with flowers, beads, ribbons, or whichever decorations you fancy. Colourful flowers, particularly, bring this type of centerpiece to life. Content ©2019 Shamrock Candles CC and its licensors. All rights reserved.